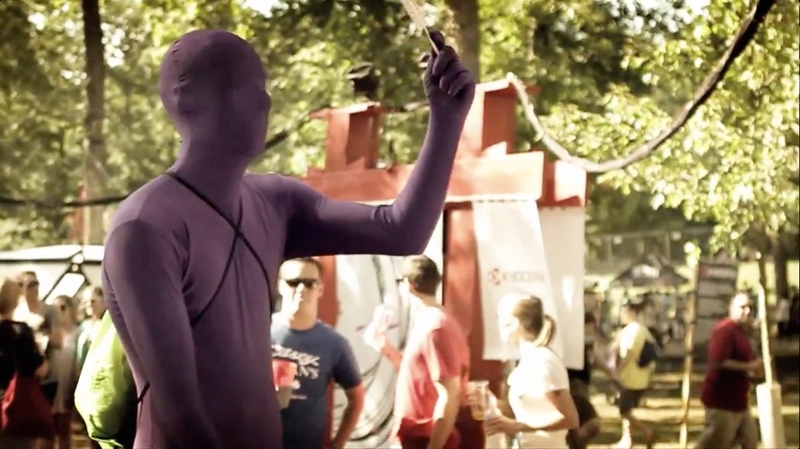 Virgin Mobile, Kyocera, Mother New York and MPC Digital produced the Echo Temple, an interactive sound installation at Virgin Mobile’s FreeFest, a full-day music festival at Merriweather Post Pavilion, Columbia, Maryland, attended by 50,000+ people. The Echo Temple allowed visitors to play virtual musical instruments by moving their bodies in front of motion tracking cameras. The Echo Temple included six speaker towers with motion tracking cameras encircling a central tower. Participants standing in front of the speaker towers were able to manipulate a different melodic instrument’s volume, pitch or audio effect by moving their body and waving fans branded with special symbols. The central tower produced the core of the mix: drums, bass, drones and the main harmonic progressions, and had architectural bamboo that could be tapped to trigger percussive sounds within the mix. Cameras in each tower were fed into embedded systems running a custom build of ReacTIVision which tracked symbols, body movement and camera activity. The information was sent to Cycling74 MaxMSP, which transformed the raw input into meaningful musical control information for Ableton Live. The Echo Temple project was developed at Mother New York in collaboration with MPC. The project was produced at MPC by head of digital content/director Wayne Robins, creative technologist Neil Voss, developer Brian Chasalow, composers Neil Voss and Chris Chapman, audio tech Christopher Burdett, producers Christos Mountzouros and Matthew Ward, camera operator Adam Donald, production assistant Alliah Mourad, flame artist Alex Lovejoy and colorist Mark Gethin. Editing was done at Cut & Run by editors Alex Dondero, Adam Donald and Wayne Robins.